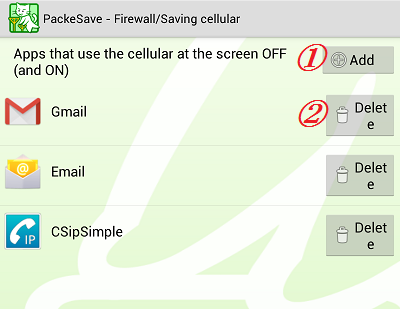 Application list for screen-OFF cellular communication. This is the line specifies application(s) to communicate at the screen-OFF. Normally,App icons that you specified are lined up as above. Apps that are lined up in here, can communicate cellular at the screen OFF. In this menu, a list of the apps will be displayed one by one with name and icon. When you tap the top part (1), you can add an app to the list. When you tap the [Delete] button (2) on the right side of each app, you can remove the app from the list.